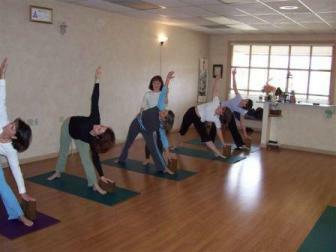 The Yoga Center of Jackson offers daily classes as well as occasional weekend workshops. We have classes to meet all fitness levels and can accomidate most needs. Through the Yoga Teachers School of Excellence we also offer a Registered Yoga Teacher training program. GENTLE YOGA - This class is perfect for those who have lost flexibility, suffer from irritating joint aches and pain or need a very low impact fitness program. Students can expect to learn simple yoga breathing, improved posture, easy yoga beginner poses with props, relaxation techniques and stress relief. This is a gentle class recommended for students with fibromyalgia, arthritis, extreme stiffness or physical limitations and can be done in a chair. BEGINNER BASICS - This class teaches the fundamentals of yoga. It emphasizes breath work, alignment, improved posture and stress relief. It is the perfect class for new or returning yoga students to work toward Intermediate level. INTERMEDIATE - This level is a basic class for yoga students. They should have some prior experience in yoga and be familiar with the primary yoga asanas. RESTORATIVE YOGA - A deeply relaxing, stress relieving yoga class. PILATES - Strengthen body core (abs, gluteus and upper legs) in this fun class. No prior experience needed! ADVANCED - This class is for the serious student who wants Vinyasa (Asanas linked together in flowing movement) or Kundalini (Energizing yoga). Asanas experience needed! YOGA FOR HIPS AND LOW BACK - This class is specifically designed to restore the balance between lengthening and toning the muscles in the low back and hip region. The class is recommended for men or women who may have experienced chronic hip or back pain.